John Hagan (19) and Ryan Nolte lift the trophy after the Bulldogs won the Division 2 South final. 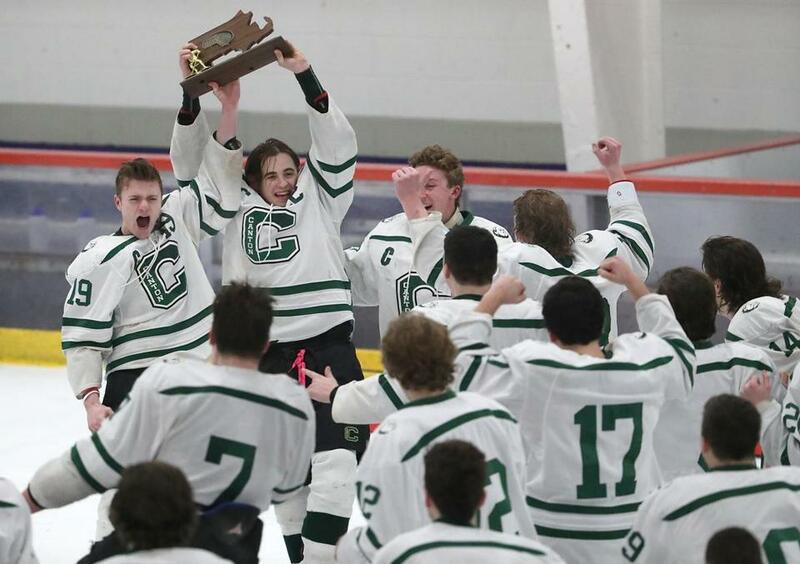 Canton High, the lone unbeaten boys’ hockey team remaining in the state, will skate for the Division 2 title Sunday (March 17) at 3:15 p.m. against Tewksbury High at TD Garden. The 24-0-1 Bulldogs will be playing for the program’s first title since 2009-10, when coach Brian Shuman and his squad broke the ice after being denied the previous March by Newburyport in the final. The current Canton edition earned its trip to the Garden with a dominating 8-0 victory over Westwood in the South final at Gallo Arena in Bourne. Canton has been led by its three captains: senior forward Ryan Nolte, junior forward John Hagan, and senior goaltender Michael Staffiere. Nolte averaged nearly three points per game in the regular season, putting up 25 goals and 31 assists for 56 points while Hagan tallied 15 goals and 24 assists for 39 points. Staffiere has been a reliable backbone for the Bulldogs, posting a 1.00 goals-against average. Through four rounds of the Division 2 tournament, Staffiere has allowed just a single goal. Shuman would know. He was coach when the Bulldogs banded together for their title run nearly a decade ago, motivated both by their loss to Newburyport in the 2009 state final — 4-3 in overtime — and the death of former teammate Scott Hurst. In their rematch against Newburyport, Canton won the state championship, 4-2. Now a 25-year-old center skating for the New Jersey Devils, Kevin Rooney was the star, scoring 36 goals as a junior before leaving Canton for Berkshire Academy, Providence College, and ultimately the NHL. Other players from the 2009-10 squadechoed his sentiment. “I’ve played on so many hockey teams — that team is the closest team with the best chemistry I’ve ever been a part of,” said Matt Buckley, a senior defenseman who went on to play hockey at Saint Anselm. Nick O’Connor was a freshman on that 2010 squad. He is now a senior caption at Colby College, after completed a post-graduate year at the Berkshire School and playing for the Bay State Breakers in the US Premier Hockey League. “It was huge for Canton to get its first state championship after it had so many phenomenal teams with great players that were so close,” said O’Connor. Rooney, Buckley, and O’Connor can’t wait for the state final. O’Connor will be at the Garden rooting for the Bulldogs. The other two will be following the game live from their respective locations. That passion, that connection is still there.